Home // C.O.R.N. Newsletter // 2015-14 // Purple and Yellow Corn, What is Going On? Purple and Yellow Corn, What is Going On? Corn seedlings often turn yellow (due to low nitrogen uptake and/or limited chlorophyll synthesis) or purple (reduced root development) under cool, wet conditions. Some hybrids are more likely to increase anthocyanin (purple pigment) content when plants are cool. Yellowing or purpling of corn plants at this stage of development generally has little or no effect on later crop performance or yield potential. If it's induced by environmental conditions, the yellow or purple appearance should change to a healthy green after a few sunny days with temperatures above 70 degrees F. If plants remain yellow then closer inspection and assessment is needed to determine if yellowing is caused by nutrient deficiency or some other factor. Environmental conditions (high rainfall causing saturated soils) can lead to the appearance of yellow corn. The visual appearance may be interpreted as N deficiency, but this is rarely the case. Excessive water leads to poor respiration of the roots inhibiting nutrient uptake. This results in the chlorotic appearance which resembles N deficiency. After soils dry out, the appearance returns back to normal. If the chlorotic condition persists after the soil dries, the problem should be investigated further. This short-term condition should not affect yield potential of the crop. 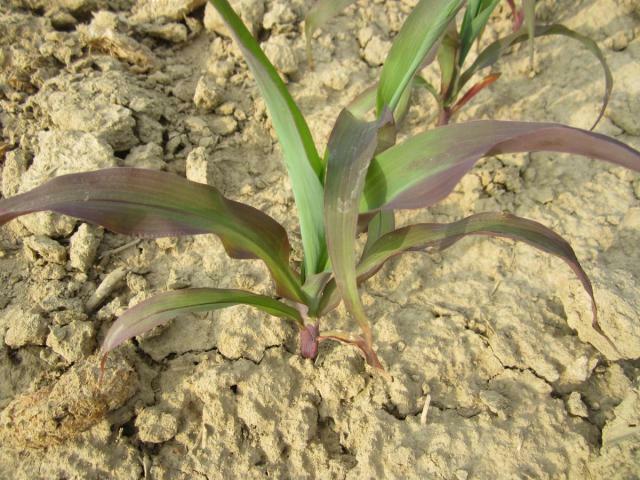 When you combine recent cool nighttime temperatures, high radiation levels during the day, and wet field conditions, you are likely to start seeing purple plants in some corn fields. The first thing that may come to mind is a phosphorus deficient soil. This is unlikely the case, especially this early in the year. The purple tint is more attributable to the production of anthocyanins which is a plant response to a stress or a combination of stresses. Cool temperatures, high solar intensity, and water stress (drought and water-logged conditions) combine to inhibit root growth. Other factors including soil compaction, herbicide injury, etc. can make the effect even more pronounced. Purple corn can also be the result of what is known as the “fallow syndrome.” If corn follows a fallow season, a root fungus called mycorrhizae reaches a low population. Mycorrhizal infection of corn aids in phosphorus and zinc uptake. Until the fungal growth is stimulated by the corn roots, which exude starches and sugars, the purple color may persist. Fortunately, the purple tint is short-lived and rarely persists beyond the V6 growth stage. It should not have an impact on the yield potential of the field.